The email said “Marvel Studios - Open House Invitation.” What that meant, I didn’t know. But it’s Marvel, so I went, and I’m glad I did, because I got to see concept art, footage, and/or more from every known movie on their schedule, up through Captain Marvel. Yes, Infinity War, too. Before a (still-embargoed) screening of Guardians of the Galaxy Vol. 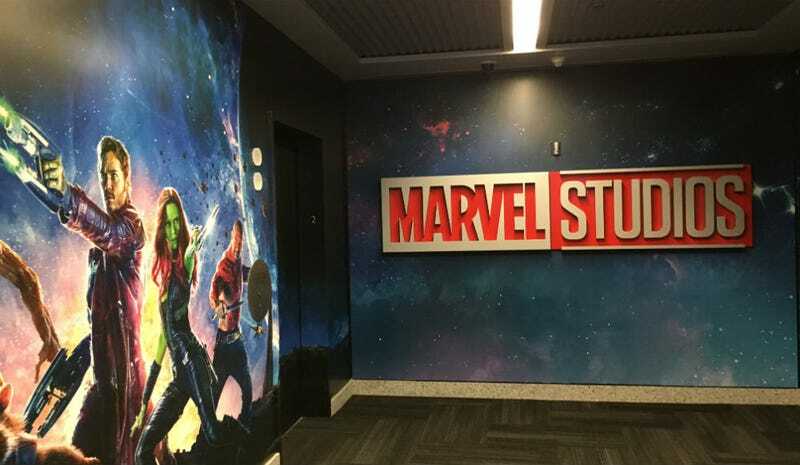 2, io9 was among several outlets who were lead on a tour of Marvel Studios’ new offices on the Disney lot in Burbank. Along the way, we got peeks and glimpses at this year’s Spider-Man Homecoming and Thor: Ragnarok, next year’s Black Panther, Avengers: Infinity War, and Ant-Man and the Wasp, as well as Captain Marvel, currently without a director and scheduled for March 2019. Here’s what we saw. After Guardians, this is the next film coming out from Marvel, and we were treated to concept art courtesy of the visual development team, as well as a screening of updated effects shots, just like Marvel execs might watch on a daily basis to check on the film’s progression. Since we already know so much about this film, there wasn’t much in the way of exciting news, but we did see some very dynamic action shots that featured Peter being thrown through a bus the long way, getting punched out of the frame, and riding a jet it engine. The most revealing shot, however, was of Logan Marshall-Green’s character, the Shocker, shooting a highly advanced gun, then handing it to Donald Glover’s character. No one would say who Glover was playing but, it seems he is certainly one of the bad guys on the Vulture’s team. The biggest news on the tour came from this film, which is out in November. We were ushered into an editing suite at Marvel, which is basically just a small movie theater with a bunch of computers and monitors in the back, and greeted by director Taika Waititi. He’s still editing the film but wanted to show us a brand new character that has yet to be revealed—one he plays himself. It’s Korg, a stone alien of the Kronan race, who is trapped in the gladiatorial games just like Thor. He’s almost eight feet tall so Waititi played him in performance capture. The scene we saw was Thor being thrown into a strange cell with Korg and Miek, his sidekick with knife hands. Korg starts to tell Thor about how things work here, that’s he’s the leader, and no one has survived a battle with the grand champion, i.e. the Hulk. Using Waititi’s deep New Zealand accent to its fullest, the scene is laugh-out-loud hilarious as Thor tries to make sense of this weird rock creature. He even tries to run away, only to realize the cell is an infinite loop which can’t be escaped. Concept art and effects tests for Korg and Miek were impressive, as each character brings something truly weird to the world of Ragnarok. Out of every film on the tour, this was the one that was most well-represented. According to Marvel producer Jeremy Latcham, the film finishes filming on April 19 at which point director Ryan Coogler will begin editing the film. We saw a sizzle reel explaining the world of T’Challa (Chadwick Boseman). It included some truly spectacular concept art and images that go by so fast, it’s hard to detail them all, but what did stand out was the bustling technology of Wakanda: Black jet planes and huge buildings that look modern, but also have a very African feel. There was a shot of what appeared to be two Black Panthers fighting in some kind of underground area. And just beautifully vibrant costumes on everyone, but especially the Dora Milaje. There was a scene in which T’Challa appeared to be fighting someone on a rhino, and also a black arm gauntlet that looks like a panther with the mouth opening at the fist. Then, we saw dailies from Black Panther. There was a scene of Lupita Nyong’o’s character (who wasn’t named but referred to as a member of a border tribe) silently killing a bunch of soldiers. That was followed by the Dora Milaje, the royal bodyguards, on a boat surrounded by blue screen, on the way to the king’s coronation; their costumes were beaded, red and gorgeous. Then the border tribe returned, dressed in all greens, going to the same event on a similar boat, where everyone is dancing in unison. We then saw what was likely part of that coronation. It took place at Warrior Falls and featured T’Challa walking down a ramp in front of a cliff lined with all kinds of people, where Forest Whitaker’s character introduced him to the crowd. Boseman didn’t have a shirt on so you could see a huge tattoo going around his back and onto his chest. The footage shifted then to a casino in Korea where Klaw (Andy Serkis) enters with eight men and talks to Everett Ross (Martin Freeman). Ross noted that Klaw’s entourage is so big, he must have a mix-tape coming out, to which Klaw replies, “I do, get him the link.” There will be a big shoot out in this casino featuring both those characters, as well as T’Challa. With Infinity War still in production, there wasn’t much in the way of news about this film. But in artist Ryan Meinerding’s office, he had a huge TV with a vertical image of Thanos on it. This Thanos isn’t like the ones we’d seen in the other movies. though—he didn’t have his helmet on, and he was wearing kind of a skin tight jumpsuit, as well a big bright glove with a lot of jewels on it (we all know what that is). Basically, he just looked intimidating and confident, which isn’t a good thing for the Avengers. Hanging out in artist Andy Park’s office was not just a bunch of concept art from this upcoming film, but director Peyton Reed himself. We saw a new, updated, slicker and tighter Ant-Man suit, which Reed explained has been advanced significantly because the original one was a relic. There were images not just of the Janet Van Dyne Wasp suit, but two newly updated ones. too. One looked like the suit at the end of the first film, while the other had slightly different colors. Other images showed a huge hanger with Giant Man standing in the middle of it, and then a dog’s mouth, which seemed to have the main characters in it. Reed said he was going to Atlanta soon to start filming the 2018 release. How can there be elements for Captain Marvel when there isn’t even a director yet? Well, it was explained that once Marvel decides they are going to make a movie, the visual development department goes into high gear, designing costumes and scenarios they’d like to see in the movie. Now, this stuff doesn’t always end up on-screen, but it’s meant to serve as inspiration for filmmakers once they come on board. For Captain Marvel, there were three pieces of art shown on the tour. Two were simply of Brie Larson as the character in an updated costume. This might not be the costume once the film hits but it looked similar to the one in the comics, just with a darker blue base and more lines going up and down it. The third image was of the character punching the fist of some kind of giant robot in an action scene. It had a very Hulk vs. Hulkbuster feel to it.